John Whitmore was born in Leicester. 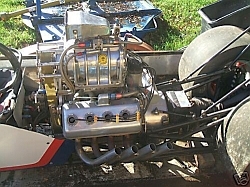 An electrical engineer by trade, John was inspired after a visit to Santa Pod to build a front-engined slingshot dragster powered by the four-cylinder BMC A series engine with a host of home made or modified parts, all British. 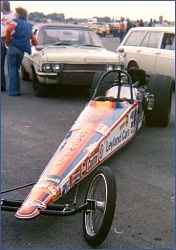 After records and many event wins with the slingshot, in 1974 he built a rear-engined dragster powered by the same engine type and running times deep into the eights. John competed in Sweden in 1976 to 1978, winning the Dragster eliminator in both 1976 and 1977 leading to sponsorship by British Leyland. In 1980 he débuted a new Daimler dragster in which he ran his first seven the following year. After his career led to designing and installing automotive test systems around the world, John retired from the sport. This interview was conducted by Simon Groves in June 2014 . Eurodragster.com thanks Stu Bradbury of the British Drag Racing Hall of Fame for helping to arrange the interview. Eurodragster.com: How did you get trained in engineering skills? John Whitmore: I didn't train as a mechanic; I was born in Leicester and started my career as an electrician. I worked with conduit, mainly industrial work. I did well at college and got a silver medal from the Electrical Contractors' Association which meant I was in the top three in the whole country. I got into estimating but later the company, Brush Electrical Machines in Loughborough, decided they wanted to get into automotive test systems and they employed a qualified mechanical engineer, not a nuts and bolts man but someone good technically. Because I had developed mechanical skills from drag racing they took me on. 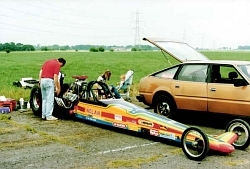 Eurodragster.com: How did you first discover drag racing? 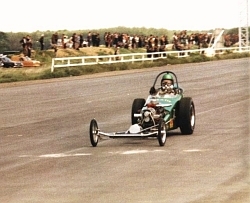 John Whitmore: I saw Santa Pod advertised in one of the magazines in 1967 and saw Bud Barnes in the Ultrasonic fueller which was the most spectacular thing you could imagine; it smoked the tyres all the way up the strip. It was very impressive. There were other American cars doing racing and it was a great show. 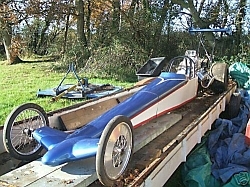 Eurodragster.com: You were sufficiently impressed to build your own car? John Whitmore: Yes, I thought I could make a dragster, similar to Harold Bull's, as I had a tuned-up Morris 1100 with a BMC A Series engine, and some tuning parts. I went to a scrap yard where I found an old Morris Minor with an engine in it, which I took out, it took about ten minutes. I just undid a few bolts and out it came along with the gearbox. For the chassis I went to an electrical wholesalers, bought five lengths of electrical conduit, tied them underneath my car to the front and back bumper, bought an Oxford welder never having done any welding before and I made a chassis. The back axle was out of an Austin A35. I later made a new chassis out of mild steel tube and built a new body for it. You couldn't get alloy steel easily then. The original car had steel wheels, although the later one had magnesium wheels and a Wolseley 1500 back axle. I noticed Harold Bull had a supercharger and injection on his car and I thought "I've got to get one of those". I saw an advert in Autosport for a similar supercharger, and my father fetched it from Southampton for me. It was a bigger one than Harold Bull's but the same make and so I was able to use it. I was lucky, because it was very weak and used to break where the inlet manifold was, if you had a pop, it would split the blower open. Nobby Hills worked in the road construction industry and road burners had one of these superchargers on them to melt the road surface to dig it up, and he gave me a pile of bits, old casings and spares that were not used any more: I was able to keep going by using those bits. Once I got the supercharger and fuel injection which I made myself out of an oil pump from an A series engine and put it in a brass casing to pump the fuel. I couldn't afford a Hilborn fuel pump so I used my imagination and it worked. I made my own barrel valve which was really a form of tap. I saw one in pieces that the big cars used and thought I could make one. In 1970 the car was Drag N' Fly. By 1971 John had moved up another class to E/D with a 1293cc engine. Eurodragster.com: Did you have partner or crewman helping at the track and in developing the car? John Whitmore: Ken Bonham did loads of machining for me, made a flywheel and other drive components and came to the strip to help. He was a character, always jolly and happy and the life and soul of the party. I later worked with Paul Claricoates who I am still in touch with as he lives in the outskirts of Leicester, and Shirley Ayre, who is now in Canada. Eurodragster.com: How did you meet Paul Claricoates? 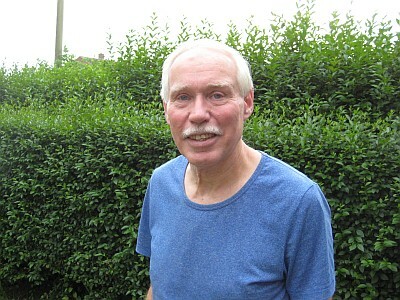 John Whitmore: I first met him in about 1968 or 1969. A friend of his said to him he knew a chap who was building a dragster and did he want to see it. He said yes without having a clue what it was as he had never heard of one! But as it had wheels and an engine he was all ears, as he said he had been messing about with spanners since he was big enough to hold them. I had a lock-up near my house; Paul only lived about a mile away and was keen to get a bit more involved if he could. He would call in at my lock-up in the evening when the light was on to see how I was getting on. My first chassis was hanging in the roof. It had failed scrutineering because something at the front wasn't strong enough, so I was rebuilding the car with a new chassis. One time after a few visits Paul called in, and I asked him if he could help me with something, so from that point on he started coming round more often and helping me, just with bits and bobs. At some point in 1971 or 1972, I said Paul should go and see some drag racing, so Shirley (his young lady) and Paul went to RAF North Luffenham to see their first drag race, which they both thought was great. They then went to Santa Pod and got close to the track at the top end as well. Eurodragster.com: How did Paul and Shirley become regular crew? John Whitmore: At this time my parents went to help me, sometimes when my mother didn't go I would give Shirley and Paul her ticket and they went and helped out. When my parents gave up going I would give them both tickets and they became full-time pit crew, and would come round to my lock-up most Wednesday evenings to help with what they could. Between 1972 and 1980, Shirley and Paul went to most of the meetings. Apart from general help in the pits, Shirley became the main push car driver and Paul sorted me out on the start line. On one occasion I covered Paul from head to toe in bleach down one side doing a burnout while he was walking round the back of the car to put bleach down in front of the other wheel, he bent my ear about that afterwards! Eurodragster.com: What was your main engine type then and did you have special parts? John Whitmore: I started with the early A series from the Minor and A35 and later went to the Cooper S type engine. The block was the same, but transverse. Slowing at the top end at Santa Pod. By 1971 John had run his first nine. A lot of parts were available cheaply for those engines as they were used for racing a lot. I managed to get three crankshafts from BMC Special Tuning Abingdon when they had a sale on. They had flanges on as they were for Cooper S 1275 cc engines. They were competition cranks and I then had to make my own seal on the end of the crankshaft as my engine was in-line and the Mini engines were transverse. I also got four connecting rods from Special Tuning Abingdon and it turned out they were shorter than the standard ones, but that was just the job for me with the supercharger because I needed a lower compression ratio. I could never get any more because they weren't production, but those that I did get were sheer luck. I used nitromethane and went to a 65% mixture eventually but it was very dodgy with the home made fuel injection. It would melt the piston rings which would burn a chunk out of the side of the cylinder wall. I had to get another cylinder block when that happened. As I got more nitro I had to put a plate between the cylinder head and the block, about eight millimetres thick, to lower the compression ratio. I cut a ring in the plate both sides and tacked in a bit of copper wire and that made a seal. I used copper sheet gasket material as well as there were waterways and oilways and needed some sort of gasket. It all seemed to work quite well and I reused the copper gaskets and heated them to repair them. Eurodragster.com: Have you been in touch with your rival from that era, Harold Bull? 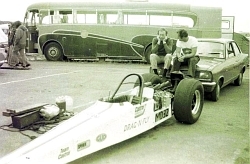 By 1972 John was down to 9.4 and won the BDR&HRA Dragster Division Championship. He ran a 151 mph terminal speed in 1973. John Whitmore: I went to a reunion at Shakespeare County Raceway and saw Harold. I saw Stripduster and thought "I can make a car like that". But it took me a long time to beat him. Eurodragster.com: In 1974 you built a rear-engined car, what was the major mechanical change to it? John Whitmore: I still had the A series engine in it and a two-speed gearbox out of the overdrive in an Austin A35 which worked well for a time but then it started knocking gear teeth off after two or three runs. I started in second and ended up starting in third but couldn't do much about it. Also I had slicks on the rear-engine car and that stopped tyre spin and put more strain on the transmission. So I got a different gearbox to replace the A35 one. I went to a scrap yard and got a Borg Warner Type 35 transmission. I didn't have a clue about how an auto transmission worked, so I took it to bits and found out how it worked, and then modified and shortened it. I got rid of the neutral clutch which shortened the tail, welded a spline shaft to one of the parts of the epicyclical gear, worked out what clutch worked what, made a little aluminium block with a rod in it to direct the oil, put it my own home-made casing, and made a manual three-position control valve to change gear. A 7½" friction clutch replaced the torque converter. The forward position was second gear, middle was first gear and rearmost position was third gear. It worked a treat and fitted the engine nicely. I used the oil pump that was part of it to pressurise the system. Eurodragster.com: Which tracks were you running at? 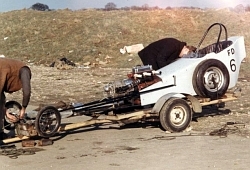 The first rear engined car was constructed before the 1974 season and won in April 1974 at SPR's Spring Nationals. John Whitmore: I ran the car at all meetings that took place. Santa Pod Raceway was the best track although we went to Blackbushe, Snetterton, Silverstone, Wroughton, Radlett and so on. I met my wife Terry at Blackbushe in 1973. Terry Whitmore: I lived in Reading, not too far from Blackbushe. I had a four-year-old daughter Joanne who said without pronouncing the Ts "Are you going for some water, John Whitmore?" which has stuck through the years. Our first date was her fifth birthday party! We had three children later, Craig, Ian and Julie, and have two grandchildren. We also had a dog at that time, which we called Leyland. Eurodragster.com: You went to Sweden with the rear engined car? John Whitmore: I went to Sweden three times. On one visit, in the final race, I didn't think I had won but I was told that I had. I then assumed that my opponent had redlit. At the presentation I was treated like royalty and the crowds were cheering. Terry had to tow the dragster down strip with me in it, then I had to go to the top of the huge grandstand to be presented with the trophy along with a huge bouquet of flowers. Later that afternoon my opponent came over to me and said that apparently there had been a mistake and I had not won that race at all! The winner (my opponent) was a very pleasant gentleman and insisted Terry kept the bouquet of flowers. We also went to Zandvoort which went well, we won there. We also went to Germany, had a shower of rain and they cancelled the meeting. In 1975 there was a new slipper clutch and the car was back to the nines and breaking class records. Eurodragster.com: What other special memories do you have? Terry Whitmore: John never redlit during his whole drag racing career. 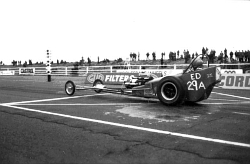 Also, on one occasion John had to push his dragster nearly the quarter mile at Santa Pod raceway, because his opponent had broken down before the start of the race, then John's dragster broke down after taking the start, in the bye run. In order to win the race, John had to complete the quarter mile with his dragster to the finish line. The crowds were cheering John all the way. John was absolutely exhausted by the end. There was such a fantastic atmosphere where spectators were bringing John cans of beer and applauding his triumph! John Whitmore: It got harder and harder to push the dragster, as the clutch started sticking as I got further down the track. Terry Whitmore: Also, our eldest son (Craig) who was a mere baby, used to infections frequently, until our visit to Mantorp in Sweden. There they had high fences around the pits, so only racing teams could get in there. A lot of John's tools were all over the place on the ground and John had drained the oil out of the dragster into an empty oil container. This oil was contaminated with nitro and Craig had got a large long screwdriver, dipped it into the old oil and sat sucking it. The spectators were trying to yell over and warn us what Craig was doing. However, although Craig had had a throat infection when we arrived at Mantorp, he was cured by the time we left, and did not have any more infections for some weeks. The infections became less frequent as time went on and Craig grew into a healthy man. 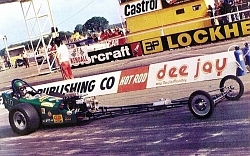 On another occasion when we were at Santa Pod, John's dragster was in bits, and racing had stopped. One racer came up to us after some time and said "Did you know your boy has been sticking pebbles down the engine?". We didn't, but, fortunately the cylinder heads were still off, so John was able to remove all the pebbles! 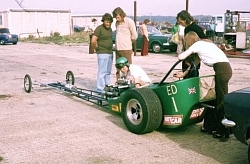 Craig also had a habit of taking the dust caps off the front wheels, which resulted in the tyres deflating with the centrifugal force, resulting in John having to pull the chute to stop quickly. Leyland support in 1976 meant new parts and the car went 8.63 at Easter. John Whitmore: On one occasion it when it was cold weather, the front engine car wouldn't start well. I had a bye run and I did a wheelie in the dragster, then after it came down I hit the throttle and it came up again. I took my foot off the throttle and it came down again. The dragster was moving across into the other lane and by then as it was tipping onto one wheel. I hit the throttle a third time and the dragster went right up into the air on one wheel. After the run Stu Bradbury came up and gave me a bollocking for crossing the centre line, but, he actually ended up saying "It was pretty spectacular, that was!". I once had a match race against Dennis Priddle. When he was in the lane next to me I couldn't even hear my own engine, as the noise of his car was so loud: I couldn't judge my revs, I didn't have a rev counter. I didn't stand a dog's chance of winning the race – it was a joke! Potentially it was an expensive race for Dennis! Eurodragster.com: How did you get backing from British Leyland? John Whitmore: Brian Taylor was trying to promote the sport and he talked to BL Special Tuning. BL agreed to sponsor me for my first rear-engine car. BL came on board after I started running eights at over 150 mph but sadly they only sponsored for one year. BL gave me money if I won, so it was a shame I did not win more often. It took a lot of work and best part of a year to get the rear-engine dragster running better. Eurodragster.com: How did the move to Daimler power happen? John Whitmore: The Daimler came about when I met a guy called Alan Sharpe. Alan worked with Gerry H Nolan who dealt in Jaguar spares. I became friendly with Alan and Gerry. They had some aluminium V8 Daimler engines, and kindly gave me one of them, along with sponsorship For the gearbox, they gave me a bigger Borg Warner Model 10 Jaguar gearbox which was the same as the Type 35 gearbox, but bigger, and modified it the same way. I also had to build a new chassis and fit a Jaguar back axle. 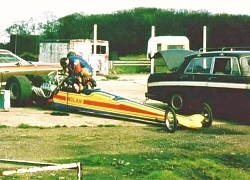 The Daimler-powered Nolan Drag N' Fly at its first outing in May 1980, running 8.40/172 on its début. I had a bigger supercharger because it was a V8. I managed to get hold of a GMC 3-71 Supercharger which was advertised, and used the old fuel injection system with the A-series oil pump in a brass casing, because aluminium didn't work. I put some castor oil in it to help lubricate the fuel. Most of the fuel went into the top hat but I put port injection on as well because the mixture distribution in the original manifold wasn't brilliant and the more fuel you put in the worse it gets. I made a load of jets to help meter the fuel going into the nozzles. I changed the settings depending on how the cylinder and plugs looked. I didn't have any special parts made but I used different pistons that fitted the bore. The dragster performed well from the start. 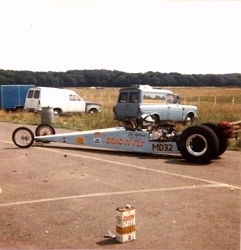 Once I got the Daimler going very well, another racer, Robin Read, made a dragster with a similar engine to mine, and made his dragster run even better than mine. Robin had a specially-made camshaft which was ground into the shaft, whereas I had a Daimler camshaft, reground to the same profile as the A-series, with as much lift as I could give it. I did manage to get a low seven second (173 mph) run in the Daimler. Eurodragster.com: Why did you stop racing? John Whitmore: As a result of the drag racing I started working on designing automotive test systems, which I went all over the world to install for Brush Electrical Machines. BEM employed a mechanical engineer to build them. They hired me because of my drag racing experience to do mechanical drawings, and help with the design of the equipment in the 1980s and 1990s. I ended up designing big rolling roads with rollers up to six foot in diameter, for most of the major manufacturers, Rolls Royce, Bentley, and Rover. There were very accurate dynamometers, for emission work by manufacturers, because they had to specify and get a car to meet the various emission regulations around the world. An extremely accurate machine was needed, that could measure the torque and speed of the wheels of the vehicle, and restrain the vehicle on the rollers, which I also designed. The rollers had to be able to move the wheelbase to accommodate different cars. I went to the USA for twelve months, where I raced my hire car in a bracket race at Detroit Dragway, and another track nearby where I won two races. I dialled in around fifteen or sixteen seconds in my street car. In the US, if in the Heavy class (Camaro etc) one was to lose, one could change class – to Street. I had a big Camaro in the lane next to me, and although he nudged ahead of me at the finish, because of the fourteen-second break-out system in place, the fact that I had pulled a perfect 0.000 light meant I had actually won the race! Each time after that race, the Camaro driver walked past me exclaiming "F***ing Limey!". Even when I went back a year later! The Daimler engine, not touched since its final run at York on 19th June 1988. I put a 3½ megawatt fan motor fan drive in for Honda in Japan. It was a big motor and it went in a twenty foor diameter wind tunnel. Its bearing diameter was six hundred millimetres. Two years later an engineer from Brush went to Japan to service it. He took the top off the white metal bearing to check it but it just so happened that the fan had stopped in the right position, as there was a pin in the bearing material and three cracks coming from it. He informed the Japanese management and I got a phone call from Japan asking if I had drilled a hole in the bearing shaft when I lined it up and installed it. What happened was that there were three cracks and a circular pin in the middle of the shaft. I took it out and it was bearing material so something had caused the shaft to crack. I asked the engineers operating it if they had done anything to it and they said "We had a bit of vibration on the motor assembly so we turned the vibration detectors down a bit". What happened was vibration between the propeller and the motor had fatigued the shaft. If that hadn't been found god knows how much it would have cost to replace. The wind tunnel was in sections of steel fully welded so it wouldn't have broken itself but it would have made a hell of a mess! What impressed me is the technicians admitted to their bosses they had turned the detector down. Eurodragster.com: Thanks for your time John, and best of luck!